Hey Out of Town-ers, this one is for you! We know travel can be a pain in the buns. Between transporting goods, where to get a good night's sleep for a reasonable price, and where to feed your hangry self after a days work. We know there are a lot of determining factors to whether or not you want to go the extra mile(s), and we want you to know we can help! We have different categories of shoppers, all which you will get to see on the day of the event! 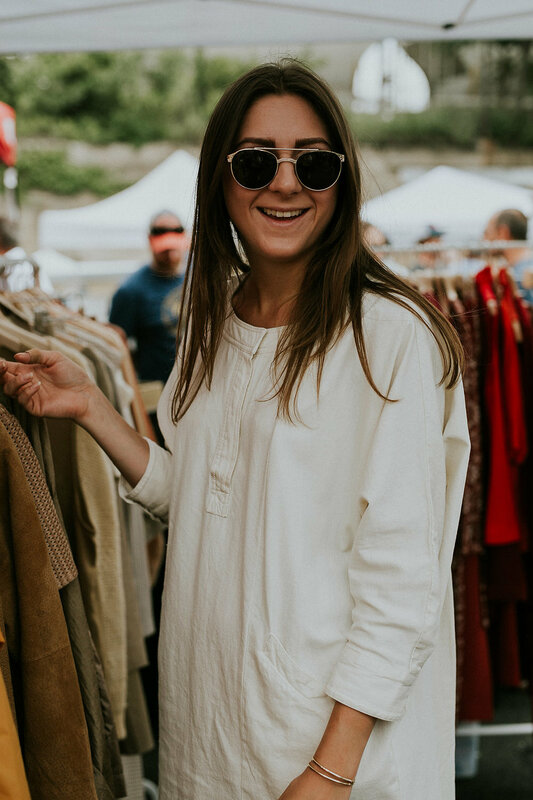 -There are the ones who come for unique, vintage style pieces. Ultimately they are looking for that thing that no one else has. -There are the ones you look at and think to yourself “I want that outfit”. They love on maker goods, and limited edition style items. -There are the ones who are dedicated to Cleveland. They come to drink, mingle, and buy goods. -There are the ones who come to just be a part of the fun and enjoy the views. -& There are the ones who just come for the food and drinks. Although those are also a love and perk for all. After the crowd has trickled out and it is time for clean up you are welcome to shop other makers goods & begin packing up your own. & Because we would love the opportunity to hang with you just a little while longer: if you plan to stay for a few days after the Flea we would love to see you at our Women Co-work Space open M-F. Find out more info here: (insert women cowork space info. OUT OF TOWN VENDORS PERK!! We will be offering a special booth fee to those coming from out of town to show off their goods. This is available for a limited time and will end April 1. Get your applications in now to be a part of something great & partake in great perks. APPLY ABOVE BY APRIL 1!!! Check out some of our favorite airbnb’s with reasonable pricing options below! The Twins Townhouse: 2 Bedroom & private townhouse, Only $59 per night! Beautiful Loft in the heart of downtown CLE: Loft with 1 bed, $75 per night! Spacious Ohio City Apt, very close to our indoor Flea space! 1 bed, $62 per night! Our amazing owner, Stephanie Sheldon, is remodeling her space to be an active airbnb this summer. It will be available July-October for you to enjoy while in town showing off your goods at The Flea. The best part about the space you ask? All the decor is based on Wes Anderson Films. I mean does it get any better than that?! -Passengers, located at the Cleveland Hostel! Perfect if this is the spot you decide to stay overnight. -Brewnuts, Donuts & Beer, duh. -Lucky’s Cafe, local gem where everything is good. -Jack Flaps, because who doesn’t love pancakes? -Le Petit Triangle, it’s as though you are taking a trip to France right in the middle of Cleveland. -Townhall, great for lunch during the week & have an awesome brunch Saturday & Sunday morning. Sweet potato pancakes are a must have. -Lago East Bank, awesome Saturday Sunday brunch. Not to mention bottomless mimosas from 11-2, #celebrate your Flea sales. -Heck’s Cafe, gorgeous outdoor seating for a sunny day. -Barrio, because taco Tuesday should be everyday. -Plum, yum & local drink options. -Alley Cat, beautiful spot down in the flats, dinner with a view. -Azure at The 9, rooftop bar with gorgeous views of Cleveland. -High & Dry, great stop for drinks after hitting up Barrio. -Platform Brewing Co., beer made in the heart of Cleveland.